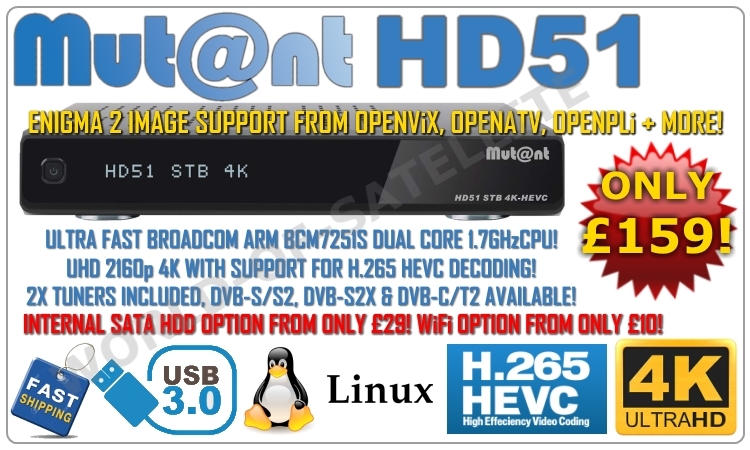 Thread: Best Selling UHD 4K Mutant HD51 only £159! Hurry limited stock! MUTANT HD51 4K UHD TWIN TUNER RECEIVER IN STOCK! CRAZY PRICE! NOW ONLY £159! INCLUDING TWO TUNER MODULES OR YOUR CHOICE! DVB-S2X TUNER NOW INCLUDED AS STANDARD! TWO PLUG AND PLAY TUNER SLOTS! CHOOSE FROM EITHER DVB-C/T2, DVB-S/S2 OR DVB-S2X TUNERS! ULTRA FAST DUAL CORE 1.7GHZ BROADCOM ARM CPU! INTERNAL 2.5" SATA HDD OPTION! FREE ENGIMA 2 IMAGE FLASHING! FAST UK NEXT WORKING DAY DELIVERY! CLICK HERE FOR FULL SPEC AND TO ORDER! LOW EUROPEAN SHIPPING RATES TO REPUBLIC OF IRELAND, GERMANY, BELGIUM, LUXEMBOURG, NETHERLANDS, SPAIN AND MORE!